The owners wanted their house to have a main level large enough to accommodate all communal spaces for their family of five, plus the master suite. The husband, a contractor, wanted a house that expressed his art, while the wife expressed interest in a modern aesthetic that retained vernacular housing elements. The design team responded with a trio of gabled pavilions, each housing basic functions: sleeping, living and utility. The first pavilion, a stucco sleeping pavilion is a solid mass of three stories plus an attic, recalling a traditional housing vernacular to establish the public image of the house. 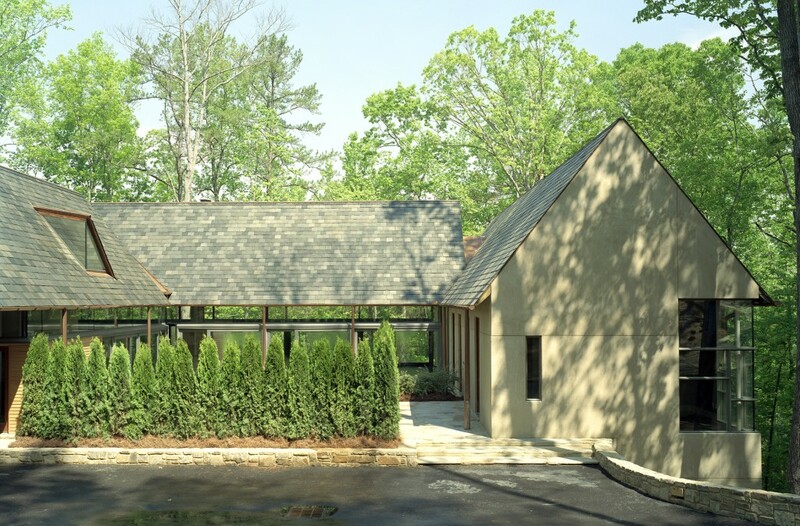 The stone, wood and glass service pavilion houses the kitchen, dining, laundry, carport and storage on one level with a guest suite above. The living pavilion is a single-story bridge of steel and glass, extending through the dining space and beyond to form a large screened porch among the trees. The pavilions are carefully inserted into and atop the landscape to capture views and frame an inner courtyard, which serves as the heart of the house.